Hi guys :) The New Black kindly send me some of their sets for review, and today I have the first 2 for you. All their polishes come in sets that easily combine to create things like an ombre mani. The first set that I swatched the other day is one of those, it's the set called Waves from their Original Ombre line, and it's a set of 5 polishes in blue/green/teal colors. If I think of an ombre mani, I think of 5 polishes that are the same in finish, and just vary slightly in color from light to dark. TNB takes it a step further, and combines different finishes and varies more in color as well! As you can see, the color on my thumb leans a lot more blue, while the color on my pinkie is green. Those 2 are cremes and applied in 2 coats, the 2 shimmers and the glitter needed 3 coats. I thought the lightest color would be a bit streaky, as such pale cremes can be, but I had no problems with it at all. I did use top coat here, because the glitter dried a bit gritty. The color on my middlefinger looks similar to my ringfinger, but it's not. It's actually a very bright & pretty green shimmer! It's so bright that it even dries a bit matte, so almost neon, and with that, it's unfortunately instantly beyond my camera. The 2nd set that I'm showing today is the Miami Vice set, from the Subculture Contemporary Neons line. All TNB sets come in a package like this. What did I say again about bright colors being way beyond my camera? Bleh, here's another one, it's a bright, peachy pink color and boy do I love it! I just wish my camera could handle such colors :( I tried making pictures in the sun as well, but those looked like a failed duochrome on my nails, lol! The pink applied in 2 coats, and it's again a color that I kinda expected to be somewhat streaky, but it wasn't. Besides the pink, this set also has a fine gold glitter in a clear base. As you can see, it covers quite well if you'd want that, but I grabbed a sponge and went for glittery tips instead, finished with top coat. But I have to be honest here, there's some things that I like less as well. The polishes don't have names or numbers (or well, the Waves all have the same number), which isn't so handy when you have a bunch. They only sell the polishes in sets, which means if you run out of one and would want it again, you'd have to buy a whole new set. Now normally you maybe wouldn't empty a bottle as fast, but these are minis and a bottle contains only 4ml. That brings me to my last point, and that's the price. I often don't comment on the price, because people have different opinions on what they want to spend on a polish, but personally, I find these quite expensive for minis. You can buy the sets on The New Black site, and do keep an eye on their European Facebook as well, they had quite a few giveaways so far! 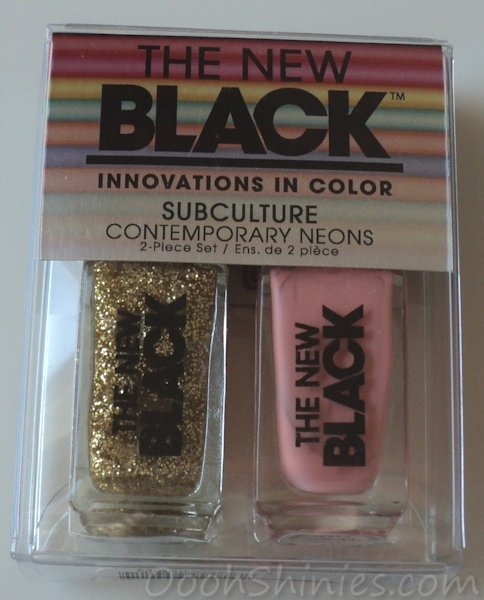 The Original Ombre sets cost €29,95, the Subculture Contemporary Neons sets cost €13,95.